After graduating Topeka College of the Ministry in 1978, McAlexander spent many years serving his home church and students as the Dean of Students at Christian Heritage College. In 1986 he was, however, called to serve in military ministry, began active duty in August of 1988, and received his first orders to the Third Battalion, MCRD, Parris Island. 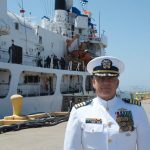 During his 28 years of Navy Chaplaincy, McAlexander served four tours with the United States Marine Corps, three years with the Navy, and three years with the Coast Guard. He was also able to attend Army Airborne School, Air War College and earn his Fleet Marine Force Pin. McAlexander has received numerous personal decorations including: Meritorious Service Medal (3 awards), Navy Commendation Medal (2 awards), Coast Guard Commendation Medal, Navy Achievement Medal, Coast Guard Achievement Medal, Outstanding Volunteer Service Medal, and numerous unit awards, and campaign and service medals. He said the most important part of his service while serving as Chaplain in the military was how he helped to “change lives.” Chaplain McAlexander to this day follows this motto. Sir, thank you for your service and dedication to the nation and for your faith and devotion. Deployed for Desert Storm on the USS Mobile Bay, CG-53. Deployed for Operation Iraqi Freedom with the Marine Air Group 13. 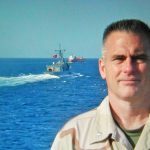 The Military Chaplain Association recognized McAlexander as the Coast Guard Chaplain of the year (2003) for his service as Deputy Chaplain of the Coast Guard in operations following hurricanes Katrina, Rita, and Wilma. Force Chaplain for Commander, Navy Cyber Forces Command, Joint Expeditionary Base, Little Creek-Fort Story. Became Fleet Chaplain for the U.S. Fleet Cyber Command-U.S.TENTH Fleet. McAlexander served his last tour as the Pacific Area Chaplain on Coast Guard Island, Alameda, California. Current Executive Director for the Chaplaincy Endorsement Commission of the Christian Churches and Churches of Christ. Bachelor’s Degree in Sacred Literature from Topeka College of the Ministry. Master of Arts in Church Growth from Cincinnati Christian Seminary (Cincinnati, OH). Master of Divinity from Cincinnati Christian Seminary (Cincinnati, OH). Volunteered to attend Army Airborne School and received his jump wings in November of 2000. Master of Arts in Strategic Studies from Air War College (Montgomery, AL). Earned his Joint Professional Military Education 1 and 2. Earned his Fleet Marine Force Qualification while he served the Third Marine Regiment in Kaneohe Bay, Hawaii. Doctor of Ministry Degree from Fuller Theological Seminary (Pasadena, CA).